Azul will begin daily non-stop service with A330-200s between Fort Lauderdale Hollywood International Airport and Viracopos/Campinas International Airport near São Paulo on December 2. It will then launch daily Orlando-Campinas service on December 15. 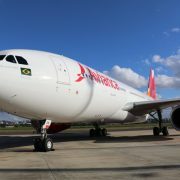 The airline launched the weekly Boeing 747-400F freighter service from Singapore’s Changi International Airport to Viracopos-Campinas International Airport in Brazil’s Sao Paulo state on August 16.